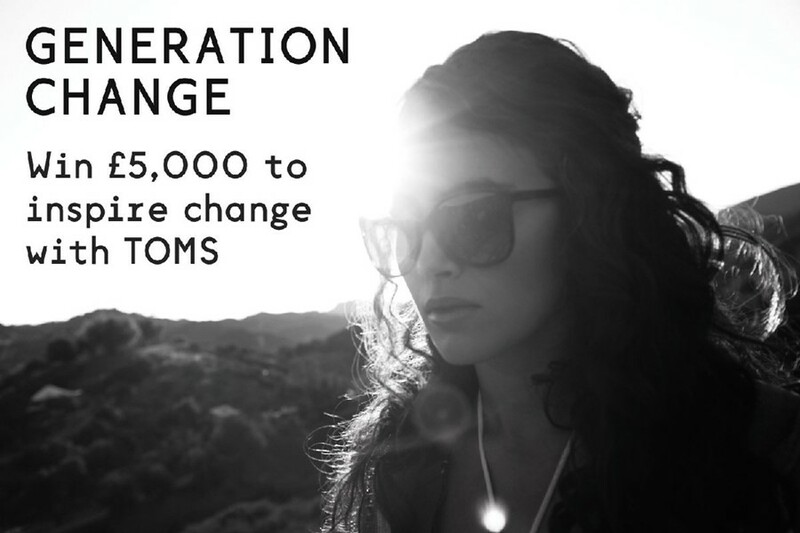 TOMS One for One and Dazed have teamed up for a new creative and exciting film project exploring Generation Change, offering the winner £5,000 to make the film. We want UK-based filmmakers to submit a treatment for a three-minute film telling the story of a truly inspirational individual or group that have started something that matters within the UK. The winning clip - chosen by TOMS, Dazed and acclaimed British director Lucy Walker (Waste Land and The Tsunami And The Cherry Blossom) - will also get an exclusive Dazed Digital screening. TOMS was founded in 2006 after Californian Blake Mycoskie had the idea to create a philanthropic footwear company that would match every pair of shoes sold with a new pair given to a child in need. It was an inspired trip to Argentina that was the catalyst for the 'One for One' movement, and a year after launching in Los Angeles, Mycoskie returned to Argentina for the inaugural TOMS Shoe Drop, packing 10,000 pairs of the label’s signature slip-on espadrilles for the kids (TOMS has since given away over two million pairs of new shoes). Earlier this year TOMS expanded the concept with the launch of 'One for One' Eyewear, which sees each pair of TOMS glasses matched with the gift of sight to one person in Cambodia, Nepal, Tibet, Ethiopia, Egypt, Guatemala, Pakistan, India, the United States, Paraguay or Bangladesh, whether via prescription glasses, sight-saving surgery or medical treatment. Dazed Digital: How did the 'One for One Eyewear' project start? Blake Mycoskie: After I saw what a difference the 'One for One' model can make in giving new shoes to children in need, it was obvious that it could be used to address other needs. On a shoe-giving trip in South Africa in 2007, sight really stood out to me. Working to help those with visual impairments was the obvious next step for TOMS – sight is a fundamental need, and 80 per cent of the cases of blindness are preventable. DD: Who are your personal global change makers and why? Blake Mycoskie: Some of my favourites include Scott Harrison, Lauren Bush and Richard Branson. It excites me to see them use their skills and apply them to something they are truly passionate about, whether it's building wells or feeding children in developing nations or tackling various world issues. DD: And how about filmmakers? Blake Mycoskie: Definitely Davis Guggenheim for his work on Waiting For ‘Superman’, as well as the directors of Freakonomics (Heidi Ewing, Alex Gibney, Seth Gordon, Rachel Grady, Eugene Jarecki and Morgan Spurlock). DD: What’s next for the summer? Blake Mycoskie: Right now, we are really looking forward to seeing the impact our Summer of Sight campaign will make for those in need. We have already helped 70,966 people, and can’t wait until we make it to that 100,000 mark and more. Submissions are open now and the closing deadline is Tuesday 28 August. All details are below.